I'm starting a new series: the Best of Columbia Heights, where I'll write about my favorite spots in a theme. And now that good weather is finally here, let's start with the best places to eat and drink outside. Feel free to add your suggestions in the comments! Wonderland: you can't go wrong with Wonderland's patio. You'll probably see somebody you know, or maybe a dog or two, and it's great for hanging out or eating. And the big tables mean you may make some new friends. 1101 Kenyon St NW. Little Coco's: the Italian spot up on 14th from the El Chucho folks has a nice front patio. 3907 14th St NW. Midlands: a beer garden! Can't argue with that. 3333 Georgia Av NW. The Red Derby: not technically outside (it's sort of covered) the Derb's rooftop is a great spot. 3718 14th St NW. Union Drinkery: if it's open, they have a big hidden back patio area, complete with an outdoor foosball table. You can get good grub from Sundevich too. 3216 Georgia Av NW. Room 11: their patio is great for Sunday brunch or a cocktail or bite in the evening. 3234 11th St NW. Red Rocks: pizza outside? I'm in. Also open for lunch during the week. 1036 Park Rd NW. The Airedale: the European spot at 14th and Spring has a big back patio/beer garden, plus a front patio and balcony. 3605 14th St NW. The Coupe: the diner, coffee shop and bar on 11th has a big patio that's good for the morning or evening. 3415 11th St NW. Lou's City Bar and Bar Roubaix: these two Irving Street spots have lots of outdoor space in front. 1400 Irving St NW. Honorable mention: Lyman's and Meridian Pint have smallish patios, but still good ones. 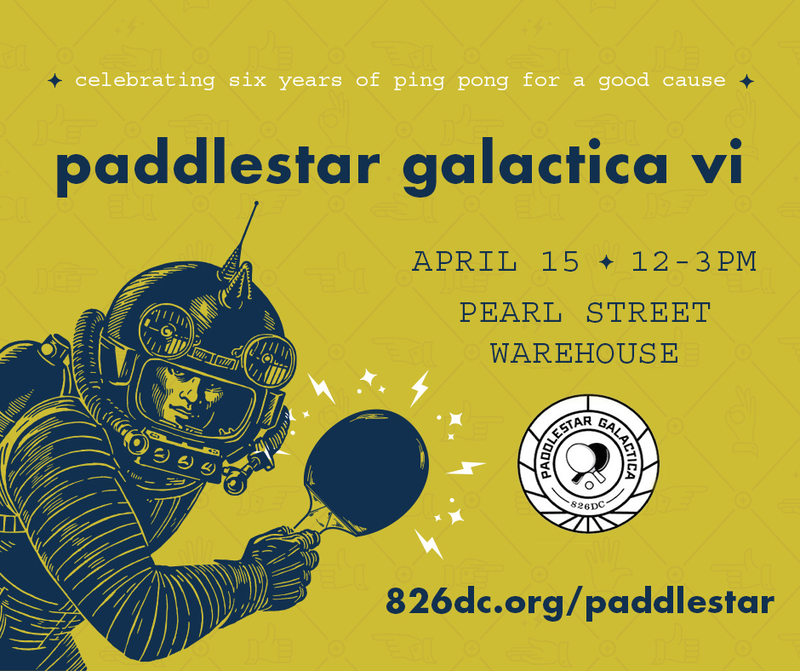 Paddlestar Galactica ping pong fundraiser for 826DC coming up; donate or volunteer to play! The annual ping pong fundraiser for 826DC, the great local tutoring nonprofit that's based on the Civic Plaza, is coming up. Paddlestar Galactica, where people collect donations for 826DC and wear crazy costumes to play ping pong, is Sunday, April 15. The event features volunteers who ask their friends and family for donations, and all donations are matched up to $35,000 as well. 826DC is raising money by having volunteers and friends compete in a bracket-style ping-pong tournament. Participants have the month of March and part of April to fundraise before competing at the main event. The more money each team raises the more cheats they’ll be able to “purchase” on the day of the tournament. All donations made through Paddlestar Galactica VI will be generously matched 1:1 up to $35,000 thanks to The Kimsey Foundation and Catherine Wakelyn. Double your impact by supporting a Paddlestar team today! Participants and supporters are invited to come practice their ping pong skills, flex their fundraising muscle, and enjoy adult beverages upstairs at Colony Club. Each week the top individual fundraiser will receive a fabulous prize donated by a local business. We’ll also award a prize to the winner of our weekly “skills challenge.” These are open practices and everyone is invited to attend! Fundraising participants will compete for a first place trophy and prestige in a bracket-style competition. Prizes will also be awarded for “Best Uniform” and “Bling Pong” (for the individual or team who raised the most money overall). Spectators are invited to help select the winner for Best Uniform. As for 826DC, here's how they describe themselves. 826DC is a nonprofit organization dedicated to supporting students ages 6-18 with their creative and expository writing skills, and to helping teachers inspire their students to write. Our services are structured around our understanding that great leaps in learning can happen with one-on-one attention and that strong writing skills are fundamental to future success. With this in mind we provide drop-in tutoring, field trips, after-school workshops, in-school programs, help for English language learners, and assistance with student publications. All of our programs are challenging and enjoyable, and ultimately strengthen each student’s power to express ideas effectively, creatively, confidently, and in his or her individual voice. 826DC is a 501(c)(3) tax-exempt nonprofit corporation based in the District of Columbia. Our tax ID number is 26-2426166. Whoa. A friend recently checked out Kraken Axes, the axe throwing bar at 3400 Georgia Avenue NW: he said it was awesome, and more importantly, a staff member said they plan to add a Viking-themed beer garden to their big parking lot. The news, also mentioned by a Yelp reviewer, means that Georgia and Morton is becoming a little beer garden zone: caddy-corner from Kraken is the Midlands beer garden. I'm pretty excited for this. My friend also said the staff member said they didn't plan for Kraken to be a temporary, pop-up type place, but to remain there. I wrote more about Kraken here: you reserve a spot for your group and toss axes. They also have food and a full bar. I'll try to track down more details about the beer garden. Has anyone else been? How did you like it? If you haven't had a chance to check out Himitsu, the well-reviewed Japanese spot at 828 Upshur from the Room 11 folks, here's a good opportunity: they're offering brunch for the next three Sundays, starting this Sunday. 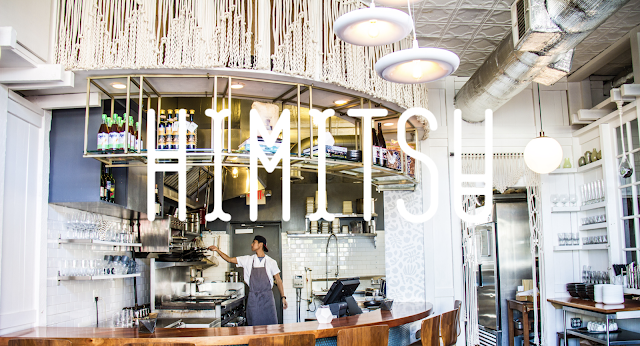 The City Paper has the full story, they'll be open 11am-3pm with no reservations accepted. The spot, which replaced Crane & Turtle, has been a critical and popular favorite, and chef Kevin Then was nominated for a James Beard award for "Rising Star Chef of the Year." The restaurant's signature fried chicken and biscuits coated in a Korean chili glaze and honey ($16) will also be available. They'll also offer mimosas with fresh squeezed juice. Snow! Finally. A lot of local spots are opening for it, here's the rundown. Will add more as I find them, and please comment below if you hear of others. 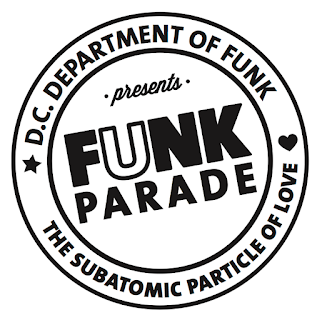 The Funk Parade needs your help: fundraiser to make sure it happens! The Funk Parade, the annual awesome music festival and parade that happens around U Street, needs your help. It's planned for May 12 but they were having a hard time raising money while still remaining independent, putting this year's fest at risk. They've set up a fundraising page where if they raise $60,000 more, local music equipment store Chuck Levin's will chip in by matching each donation -- so your money gets doubled! It's tax deductible, too. The event is really fun: multiple music stages around the area, lots of local vendors and food, booths from nonprofits and local organizations, specials at local bars and restaurants, and an awesome street parade down U Street and surrounding blocks. Here's more about the event and fundraiser from them, and here's the fundraiser link again. Funk Parade organizers announced last week that without an infusion of at least $60,000, the event was unlikely to take place this year, the event's fifth. The annual Funk Parade and festival brings over 70,000 people to the U Street and Shaw neighborhoods for a day and night of music from dozens of the city's best musicians and artists. Past Funk Parade performers have included legendary groups like Rare Essence, Backyard Band, Junkyard Band, Trouble Funk, Malcolm X Drummers and the Sun Ra Arkestra; rising DC stars like Reesa Renee, Aaron Abernathy, Drew Kid, Cautious Clay, FootsXColes, Aztec Sun and Alex Vaughn; local favorites Kokayi, Funk Ark, Fort Knox Five, Wes Felton, Congo Sanchez, UCB, Asheru, Baby Bry Bry, Brass Connection, Black Masala, and Empresarios; and sounds and artists from around the world, including Janka Nabay (Sierra Leone), People's Champs, Sinkane, Mokoomba (Zimbabwe), Jouwala Collective, Cheick Hamala Diabate (Mali), All the Best Kids, and Elikeh. The parade has featured marching bands from around the city, like Ballou, Eastern, and Duke Ellington High Schools, joined by marching bands from New York to North Carolina, and DC’s own Batala drummers. "The Funk Parade represents the heart of DC's music culture and the soul of the city that's been part of our existence for the past 60 years," said Adam Levin, grandson of founders Chuck and Marge Levin. “Chuck’s” has helped produce Funk Parade since its inception, providing support and equipment. "When we saw it was in jeopardy we wanted to jump in and see what else we could do. This is the most impactful thing DC has to celebrate the amazing music and arts that are born out of this city. It has to go on." Launched last Wednesday, the Funk Parade crowdfunding campaign had raised over $10,000 by Sunday, still short of the amount needed to produce the parade. Chuck Levin's has promised organizers it will match new contributions the campaign receives to ensure the Funk continues. "For this event to survive, DC's business community needs to step up and save it," said Funk Parade co-founder Justin Rood. "Chuck Levin's pledge shows it can be done. If Funk Parade survives, it will be because of their generosity. We're incredibly thankful for their support, and urgently hope others will follow their lead." While out of out neighborhood, a lot of kids in our area go to Seaton Elementary School at 10th and Rhode Island. They're holding a bingo fundraiser for their Parent-Teacher Organization on March 22 at Boundary Stone. Sounds like fun, and a nice way to help local kids. Come have fun and help raise money for Seaton’s Parent Teacher Organization. The PTO will host Bingo Night on Thursday, March 22, from 5 p.m. to 8 p.m. Join us at Boundary Stone on 116 Rhode Island Ave. NW. Kids welcome. Mt. Pleasant has a new vegetable-focused restaurant, Ellē, from the folks behind Bad Saint, Paisley Fig and Room 11. 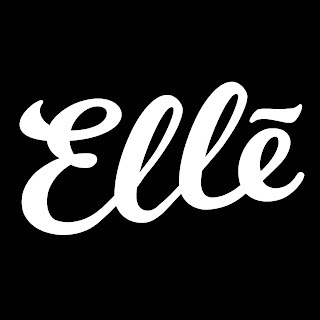 Located in the old Heller's bakery location, Ellē (pronounced Ellie) is a coffee shop and bakery during the day and restaurant and cocktail bar at night. I checked out it for dinner last week and really enjoyed it. The menu changes and there's a lot of vegetables, but meat lovers can good find things too. We got roasted mushroom gnocchi, butternut squash tartine, and a bread starter that was excellent. Service was great, and they also have really tasty cocktails and a good beer selection. Other dinner items include hot duck with biscuit, a charcuterie board, grilled kimchi toast and grilled mojo pork. It's not a huge place, so you may want to be ready to wait on Friday or Saturday, or try calling ahead. I'm not sure if they take reservations. We waited for a bit but just had a cocktail in the front area. I'm looking forward to trying it out during the day too. The bread can go fast though, follow their Twitter in case they're out. 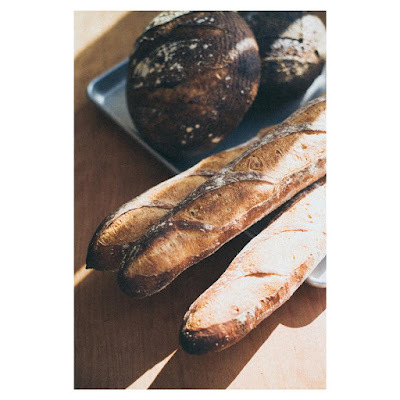 The name is an homage to Heller's, the long time MtP bakery, and also Paisley Fig bakery Lizzy Evelyn's grandmother. The Washingtonian has more about the spot. Ellē is at 3221 Mt. Pleasant Street NW. They're open Wednesday-Monday 8am to 4pm & 5:30pm to 11:30pm (dinner) and Tuesday from 8am to 4pm. Another new bar and food option! 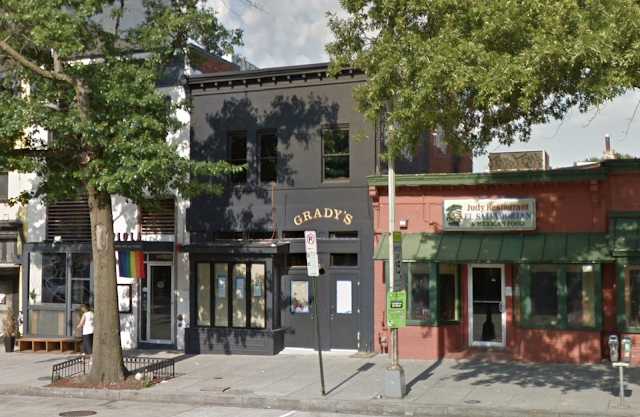 The City Paper has a big piece about Grady's, a new spot at 2210 14th Street NW, which was formerly Dynasty Ethiopian. The CP describes it as "Taxidermy, chicken wings fried in waffle batter, and stiff drinks on 14th Street NW," which sounds pretty alright to me. The owners say they hope it's a go-to neighborhood bar and restaurant and also a place to celebrate. The spot has a lot of funky decorations like old taxidermied moose and buffalo heads and other Wild West paraphernalia from the collection of a former mayor of Harrisburg, PA. It specializes in traditional American food, like chicken wings (the aforementioned waffle batter ones), lamb burger, mussels and more. There's also beer, wine and cocktails, and the most expensive beer is $6.50, which I appreciate. 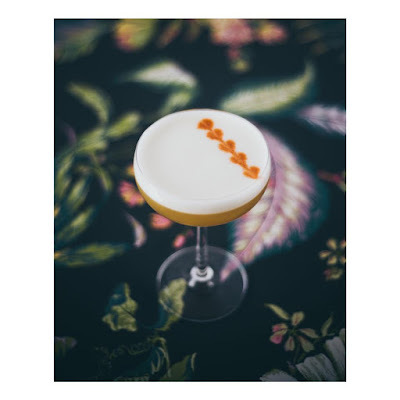 The drinks menu is run by Matthew Wilcox who previously worked at Mintwood Place, Tallula, and Le Diplomate, and the chef is Michael Hartzer, who worked at the fancy French spot Citronelle under Chef Michel Richard. And so far Yelpers love it. The spot has three owners, John Jarecki, Greg Grammen and Mark Harris. Jarecki also owns Red's Table in Reston, and Grammen owns the nearby Palace Five and Federal clothing shops, just up 14th. Palace Five, if you recall, is named for the former pro basketball team based in Columbia Heights, the Palace Five Laundrymen! No, really. Tat was their name. They open at 4 pm and also plan to do brunch in the spring. Has anyone been so far? What did you think?